Can Life on Titan Thrive Without Water? Newdiscoveries have a way of messing with old definitions. Take, for example, theconcept of a habitable world. Thestandard definition of a "habitable world" is a world with liquid waterat its surface; the "habitablezone" around a star is defined as that Goldilocks region — not toohot, not too cold — where a watery planet or moon can exist. Andthen there's Titan. Saturn's giant moon Titan lies about as far from thestandard definition of habitable as one can get. The temperature at its surfacehovers around 94 degrees Kelvin (minus 179 C, or minus 290 F). At thattemperature, water is a rock as hard as granite. Andyet many scientists now believe life may have found a way to take hold onTitan. Water may all be frozen solid, but methane and ethane are liquids. Inthe past few years, instruments on NASA's Cassinispacecraft and images captured by ESA's Huygens probe have revealed anastonishing world with a complete liquid cycle, much like the hydrologic cycleon Earth, but based on methane and ethane rather than on water. 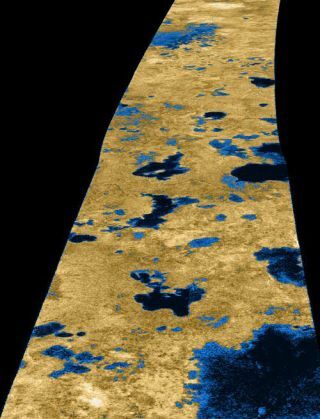 "WhatCassini actually found on Titan, from 2004 onwards, was a methane-ethane cyclethat very much echoes the kind of hydrologic cycle we see on the Earth,"says Jonathan Lunine, currently at the University of Rome Tor Vergata while onleave from the University of Arizona. Cassini has revealed rivers and lakes ofmethane-ethane, the lakes evaporating to form clouds, the clouds raininghydrocarbons back down onto the surface, flowing through rivers and collectingin lakes. It is the only world in our solar system other than Earth where aliquid cycle like this takes place. There's just no water. Butthere are plenty of hydrocarbons. Methane and ethane are the simplesthydrocarbon molecules. By themselves, they are of limited biological interest.But hydrocarbons are versatile: they can assemble themselves into fantasticallycomplex structures. Indeed, complex hydrocarbons form the basis of what we calllife. So one has to wonder: has hydrocarbon chemistry on Titan crossed thethreshold from inanimate matter to some form of life? Onething is for certain: if there is lifeon Titan, it is not life as we know it. There is no way that terrestriallife could have originated or could survive on Titan. "DNAand RNA," says Lunine, "form out of compounds that require oxygen andphosphorus, and there's very little oxygen in the Titan system." And thevery structure of DNA depends on liquid water. "DNA forms a helix becauseof its water-loving and water-repellant ends." So life on Titan "wouldhave to find other molecules that carry information." Moreover,because Titan is so cold, the amount of energy available for building complexbiochemical structures is limited. But as Lunine points out, that's notnecessarily a showstopper. "We don't have a lot of experience with thechemistry that might go on at these temperatures." We don't know what'spossible. Thechance to discover a form of life with a different chemical basis than life onEarth has led some researchers to consider Titan the most important world onwhich to search for extraterrestrial life. In a recent paper in the journalAstrobiology, Robert Shapiro, a professor of chemistry at New YorkUniversity, and Dirk Shulze-Makuch of Washington State University rated Titan ahigher-priority target for investigation than even Mars. OnMars, and on Jupiter's moon Europa and Saturn's moon Enceladus as well,astrobiological efforts center on the hunt for water-based life. But such life,even if it is found, could have shared a single origin with life on Earth,getting started on one world and being transferred by meteorites to others. Notso for Titan. If there is life on Titan, it arose separately from life onEarth. Noteveryone agrees that Titan is the priority, though. NASA and ESA recently gavethe nod to a Jupiter-system mission that will explore Europa as the nextflagship mission to the outer solar system. It may be decades before anothermajor mission flies to Saturnand Titan. Buta smaller-scale and less-expensive lander known as the Titan Mare Explorer(TiME) could launch as early as 2015, arriving in 2022 or 2023. Ellen Stofan ofProxemy Research in Rectortown, Va., the principal investigator for the TiMEmission, described the lander as a buoy-shaped capsule that would splashdown in one of Titan's northern lakes and float across its surface for aminimum of two Titan days (16 Earth days). "Wehave a number of instruments on board. The most important from a purescientific point of view is a mass spectrometer," Stofan said. "We'lltake basically a sip of [the lake] liquids, several times, and analyze them toreally nail down their chemical compositions. We know there's methane, we knowthere's ethane," but TiME would inventory more complex organic(hydrocarbon) compounds, as well. Ifthere is life on Titan, it may be difficult to detect. "I don't expect youto go to these lakes and see beautiful filamentary structures made of cellsthat are macroscopic in size or easily seen," says Lunine, who is aco-investigator on the proposed TiME mission. The clues could be subtle. "Wewould have to look for particular peculiarities in composition, hydrocarbonsthat are lacking that should be there, others that are more abundant" thanexpected. No-oneknows "what happens to organic chemistry in [Titan's] environment,"Lunine adds. "Does it go to a kind of a chemistry that we can call lifebut works in liquid hydrocarbons? We don't know the answer to that. But theanswer is profound." Because if the answer is yes, it means that the originof life has taken place more than once. "If the answer is yes, then itsays that life . . . must be a common outcome of planetary processes in the cosmos."